Hurricane Katrina Straight Line Wind Field Study at Southwinds Golf Course Area near Ocean Springs, Mississippi. As we walked down Barbaretta Drive, the damage to the houses increased. We turning right on Dismuke at the corner of Crescent Shore Drive the two houses near the corner were both very damaged. A tree was down between the houses, showing the wind came from the south. (See picture 5.) Turned down Crescent Shore Drive, we found two trees on the left side lot had been splintered. (See picture 6.) The rest of the lot was being cleaned up, the house was gone, but a tree on the west side of the lot was down, showing the wind came from the west. (See picture 7.) Across the street and down one lot, we found another tree that was splintered. (See picture 8.) Starting at these three points, eight of ten houses were gone; only one was in the process of being rebuilt. The trees surrounding this area were going in all different directions, in a classic starburst pattern. (See picture 9.) Four houses that were built on concrete pillars were gone but the pillars now were pointing in different directions. (See picture 10 and 11.) The houses must have crashed straight downward as the air dropped down, blowing the foundation pillars into a starburst pattern, i.e., going in different directions. In the Plains States and other high tornado areas, people believe that they were hit by a tornado but in reality they were hit with straight-line winds or a microburst touchdown area. If the victims stated that the tornado was noisy, like a train, they most likely were hit by straight-line winds traveling out of a microburst. In the latter instance the wind would be pushing things over as it is traveling along at a high speed at, or near the ground level. The destruction is often at an angle away from the general wind pattern hit at that time. Or if the victims stated the tornado came straight down, it is most likely that there was downward flow of air. 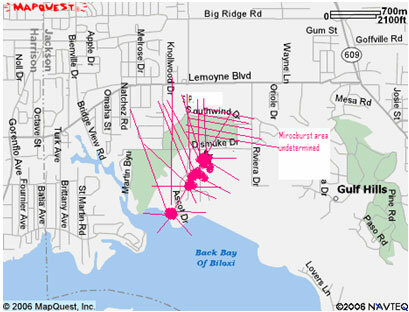 Often microburst touchdown areas just missed the person telling the story. Many people say the difference between a tornado and straight-line winds is that straight-line winds do not have a vortex that extends upward into the atmosphere. Dr. Ted Fujita in his books points out that descending air is a vortex downward. The touchdown area he called, microburst,& is very damaging as well as the straight-line winds coming out at all directions from the touchdown area. In summation, the scientific method investigation into why Hurricane Katrinas damage was so large led me to a better understanding of what happens during hurricanes. My studies led me to understand the devastating power of downburst and the immense importance for understanding how it affects houses. As with any scientific investigation, my opinions, hypotheses and conclusions are subject to study, questions, and revisions as more information is gathered.